What seems to be a very long time ago, NCHC voters picked UMD to finish fifth and Omaha sixth. Fast forward to the end of February and UMD is fifth and Omaha tied for third. And this weekend further determine where the teams will finish. More importantly, PairWise ranking can rise or fall on the weekend. Falling in the PWR is nothing new to Omaha, once top three, now getting closer to the bubble. Omaha is currently at eighth. Omaha's fall in the PWR is tied to their streak of four losses in their last five games. And that drop should not be ignored by UMD. The Bulldogs have the toughest schedule in the nation, but they have still struggled to put together wins. Ending the season at Western Michigan, a team that took five of six points on the weekend when WMU came to Duluth. The Bulldogs must focus for a strong finish over the next two weekends. Speaking of almost, but not quite, swept, UMD and UND are the only two NCHC teams that have not been swept in any series, conference or non-confernce, this season. As a side note, the only time UMD has gone an entire season without being swept was 2010-11, the same when they won the national championship. Picks by @afiskness. This weekend the NCHC teams are back at it with all eight teams in conference play. The top six teams all still have a chance to win the Julie and Spencer Penrose Memorial Cup. In my opinion last Saturdays third period and overtime let down likely cemented UMD to a fifth place finish. Of course there are other games this season where points that could have been picked up were also missed. Last Saturday's game in Oxford really shows how good this conference is and how close these teams are to each in ability. 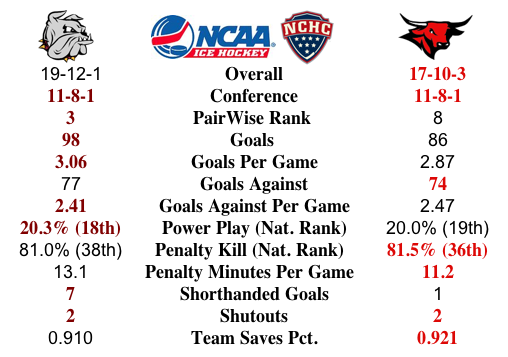 Nebraska Omaha @ Minnesota Duluth: I am not sure what to expect out of the Mavericks this weekend on the road making this a tough pick. Since the Bulldogs the last few seasons have been a better road team then home I will go with a split. Saint Cloud State @ North Dakota: This is a big rivalry series and the recent up swing in the Huskies play leads me to believe that this will be a split. Miami @ Denver: Last Saturdays come from behind overtime win likely saved the Redwaks chance to win the confernce, unfortunately for them they are playing the red hot Pioneers. I like Denver morebin this series, but I think the Redhawks will have unough fightbin them to get a split. Western Michigan @ Colorado College: Simply put the Tigers are out matched by all other teams in the conference, but the big ice and body clock will result in a split against the Broncos. #3 in PairWise and #5 in NCHC Leaves Some Wondering, "Can It Last?" UMD is in a peculiar predicament. Sitting at #3 in the PairWise (PWR) everything seems just fine. But a closer look indicates that UMD is not currently in home ice position for the NCHC playoffs that are just less than two weeks away. The high ranking position that the Bulldogs now occupy in the PWR may just be at the edge of a cliff. UMD has swept two NCHC series this season out of 10. The sweeps were at Saint Cloud and home against last place Colorado College. Conversely, the Bulldogs have not been swept in NCHC play, but close while hosting WMU where UMD only got one out of a possible six points. At 19-12-1, UMD's winning percentage is equal to UMass-Lowell's. UML is currently tied for 16th in the PWR. The Bulldog's remaining schedule includes a home series against #8 Omaha and at Western Michigan who gave UMD fits in their earlier meeting. So that said, there are likely many hockey followers who are questioning how UMD can be ranked so high, but fifth and out of home ice in their conference. Just see a Twitter sample at right. UMD has the highest strength of schedule (SOS) in the nation, but six of the seven other NCHC members are right behind them. The Bulldogs have the highest Quality Win Bonus (QWB) in the nation at 0.0194, but again they are closely followed by four NCHC teams. And, quite frankly, UMD hasn't had a long losing streak to make their numbers drop. Again, there is the potential for a problem if the Bulldogs get bounced early from the conference playoffs while teams rated below them get to rack up the rating criteria points. Nothing is for certain, except the end of the season for UMD will be interesting if not exciting. Hopefully for the players and fans, not a disappointing ending. UMD is looking to get back on track in NCHC play after a split last weekend against SCSU in Duluth. Picks by @afiskness. The NCHC has a full schedule this weekend with all eight teams in action. Currently there is a three way tie for first. How that plays out will be the story on Sunday. UMD fans will want to see the teams above them fall and the lower seated teams pick up some wins. #7 Minnesota Duluth at #6 Miami: This is the biggest series of the weekend a sweep by the Bulldogs would move them ahead of the Redhawks in the standings. UMD plays well on the road and Miami plays good at home, so I am looking at split for the series. #1 North Dakota @ Western Michigan: North Dakota goes to Kalamazoo to face the Broncos and the Lawson Lunatics. Westerns slow down style of playand being on home ice will be enough to get a split against the more skilled North Dakota Men's Hockey team. #5 Nebraska Omaha @ Saint Cloud State: Both teams have been playing great hockey the last few series making this a great matchup. This looks like a split but something tells me that the Huskies will pick up a sweep. #9 Denver vs Colorado College: This home and home series is the final two games for the Gold Pan trophy. I know that the Tigers are playing some better hockey, but the Pioneers have their number this year and will sweep the series. Back in early November when Saint Cloud was still ranked and UMD was trying to build its presence in the national picture, the Bulldogs pulled off a seldom seen sweep at SCSU. The sweep was the first for UMD at Saint Cloud since November of 1999. The two teams from that point went in different directions. SCSU found themselves in a free fall and UMD found themselves as the somewhat big surprise up and comers in the nation. The current PairWise rankings tell the story with UMD at fifth and SCSU tied at 21st. So this should be a sweep for the Bulldogs, right? Not so fast. The Huskies have found a little of a groove and the Bulldogs have had some stumbles in January. The nice showing UMD had last weekend gives hope that the team feels the importance of the stretch run. And one look at the standings should give plenty of importance of the weekend. But this is a game and the players are still young. What UMD has going for them is coaching. This is the time, late in the season, where Sandelin has shown that he has the attention of the team and it will be needed here in the last three weeks of Fenruary. StatPack. 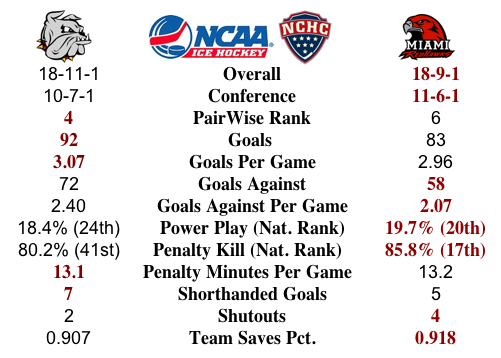 UMD and SCSU by the stats. Picks by @afiskness. All of the NCHC teams will be in action this week as the run for the Julie and Spencer Penrose Memorial cup heats up. The Bulldogs are in fourth place in the standings four points out of first. Currently first and sixth places are only separated by 10 points. I think it will come down to the final regular season week of play to determine the top four teams in the NCHC. St Cloud State @ #6 Minnesota Duluth: This in-state rivalry heats up at AMSOIL this weekend. 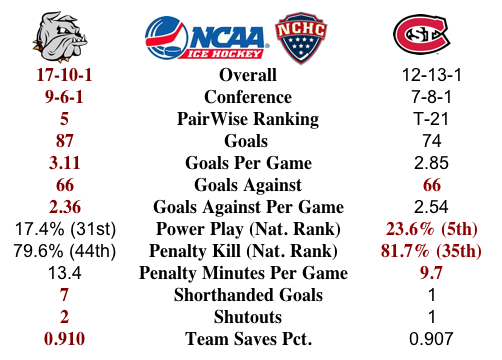 The Bulldogs swept this series in St Cloud earlier in the season but the Huskies are playing much better hockey now. UMD often stumbles at home, I am going with a split. Western Michigan @ #4 Nebraska Omaha: The Broncos travel to Omaha in this former CCHA matchup. The Mavericks seem inspired this season and even the slow down game of the Broncos will not be enough to get a win. Mavericks win and tie. 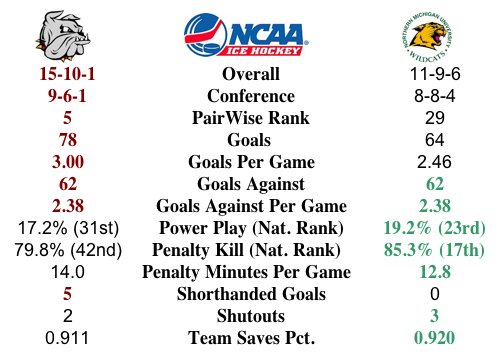 #8 Denver @ #2 North Dakota: This is another great matchup this weekend. Neither team likes each other much. The Pioneers will escape Grand Forks with one win in a split. #7 Miami @ Colorado College: The Tigers are just not that good this season but at home if they get an opportunity they could get a win. The Redhawks have struggled at times on the road, this should be a Redhawks sweep, but I am going to pick a Tigers upset and a split. Rankings. What are they good for? Gophers started at #1 and stayed for a good month plus, now they are out of the top 20. But they do give a little direction of the national view on a team's place in the greater picture of the sport. That being said, this weekend will mark the fourth and fifth games for UMD where they will be playing a team out of the top 20 at the time of the game. Yes, even Notre Dame was in the top 20 when they met in October. The resultant of that stat is that the Bulldogs have the #1 strength of schedule (SOS). And that SOS has kept them afloat in the PairWise as of late when UMD has had somewhat of a swoon. That needs to end this weekend. The Bulldogs cannot rely on the SOS to save their ship now that it is February and the weekends are getting few. Wins are what counts more than ever now. And a sweep this weekend could rally go a long way. Pick by @afiskness. Last weekend UMD played two good games against the Denver Pioneers and were able to comes home with a split, keeping pace with the teams ahead of them in the standings. The reemergence of the Huskies in St. Cloud is making the push for home playoffs more difficult for all teams. I expect to see the final standings to look different than they do today. #10 Denver @ Colorado College: The Pioneers split with the Bulldogs last weekend and the Tigers got run out of their some rink by St. Cloud. This is a big rival game but even with the home ice Denver will win this game putting them up 2-0 for the Gold Pan Trophy. Western Michigan vs. #8 Miami (Hockey City Classic, Chicago, IL): This outdoor game should be a good matchup. Last weekend these two teams played to tie in Kalamazoo and I think we will see the same result. Northern Michigan @ Minnesota Duluth: The old WCHA rivalry gets rekindled this weekend at AMSOIL Arena. The Wildcats have not played well in the road this year and will have to rely on goaltender Mathais Dahlstrom to carry them against the Bulldogs. UMD inconsistency at home is worrisome, but I think they will be able to light the lamp and get a sweep.